The second largest canyon in the US is Palo Duro (south and slightly east of Amarillo) in TX. Perhaps we’re a bit jaded by the spectacular sights we’ve seen in the Southwest in the last few months, but we were a bit unimpressed with Palo Duro. Wild turkeys and deer roaming through our campsite a couple of times a day added interest, especially since these seem to be the hugest turkeys we’ve ever seen. We headed out on our bikes thru the scenic drive that passes thru the park, and had a great ride, especially thru the flooded section. Remember when you were a kid and would have spent the entire day riding back and forth through that same puddle? We were such cowards – the deep sand on the bottom was a big problem in getting across, but we both made it – although our reward was soaked shoes and feet for the rest of the ride. 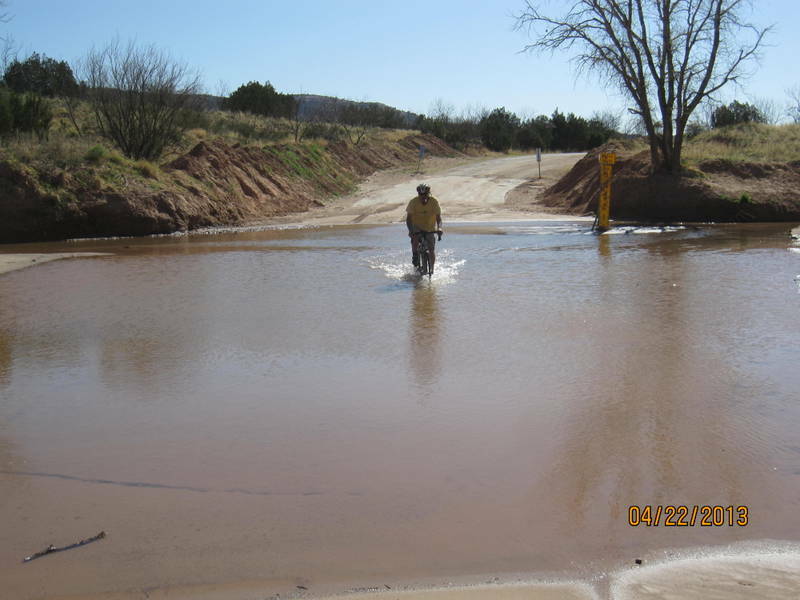 Why that section of road was flooded is a mystery – there hadn’t been rain, and the rest of the park was bone dry. The rest of the ride we completed on the wonderful mountain bike trails in the Park. 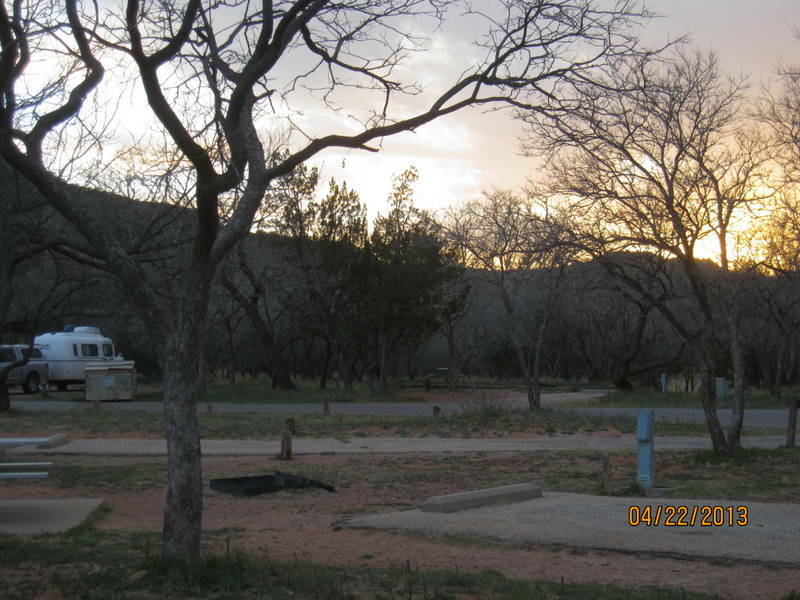 One of the things we really liked about Palo Duro was the amphitheater area. 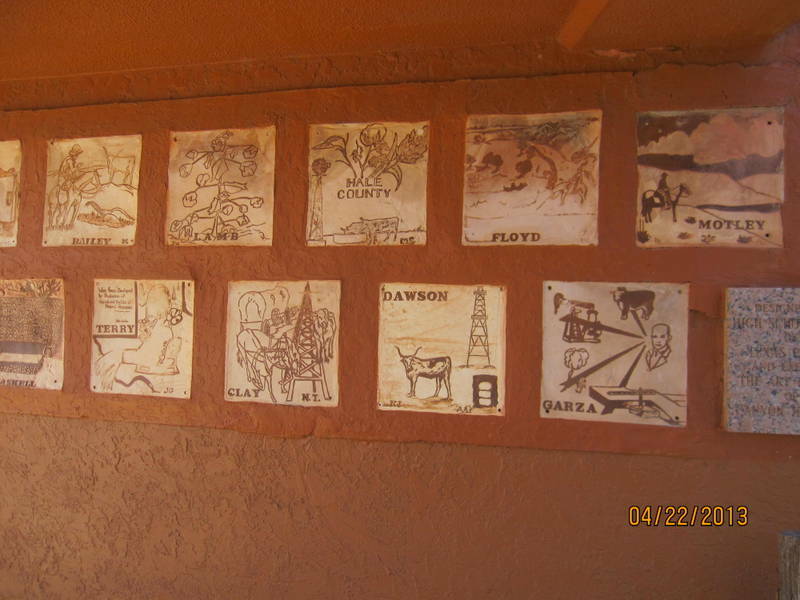 They had a wall of adobe tiles representing each county in TX, designed by high school students. It heated up to 85 degrees in the afternoon, and we became shade seekers. No phones and no internet access limits your options when it’s very warm with no shade. We used our air conditioning for the first time, and were pleased and relieved that it actually worked, and worked great. Things got crazy again at sundown when the temperature dropped to 25 degrees, and the wind picked up to 25mph. That’s really COLD in a trailer like the Fireball. 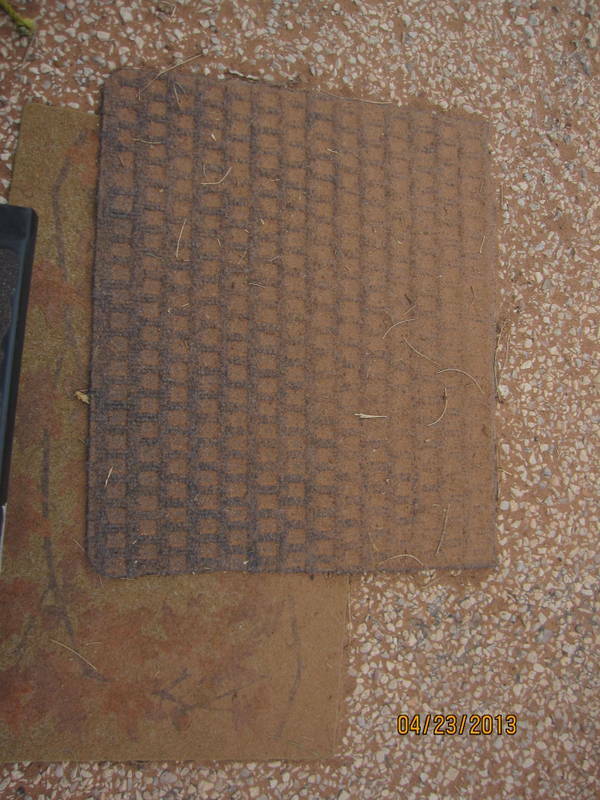 The doormat outside the Fireball in the morning after the windstorm (again). In the morning, we again found ourselves cleaning red dust out of everything. Things continue to break or go wrong, as is wont to do with trailers. Our hot water heater quit without warning two days ago, so we’re heating water for dishes, and any using our own little shower now out of the question . On the road today, we lost part of our sewer hose, our outdoor light works intermittently, the microwave is history, and we need some serious work on the interior structure of our kitchen supply cabinet. On the plus side, we’ve got a nifty bookshelf, silverware holder, outdoor butane cooker (we don’t like to cook inside), new O-grill for outdoor grilling, and we’re really happy with our new outdoor hooks for drying wet things. We’ve conquered many of the little things about living in such a small space, and we’re pleased with our progress there. We’ve moved on to Lake Arrowhead SP near Wichita Falls for one night. We’re happy that nobody else is here. For 65 campsites, there is just one bathroom with two showers. Must get pretty crowded in prime season. Lovely – it’s really green here, and looks a bit like home. The prairie dog population here is crazy – there must be hundreds of them, and their houses are huge – like prairie dog condos. Jezzy was wild to get a closer look. We’re headed toward Grand Rapids, but not really sure why. We watched the national news on TV tonight (courtesy of our new $40 digital antenna), and saw GR has record flooding. In the newscast, we saw photos of fish and ducks swimming past office windows in the downtown area.That sure didn’t increase our desire to rush back home. Hoping that our house is indeed high enough to avoid anything but a really wet yard to deal with. We’re going to just sneak north of the TX border into Arkansas tomorrow night (Wednesday). Hoping to still find new adventures before we get home. 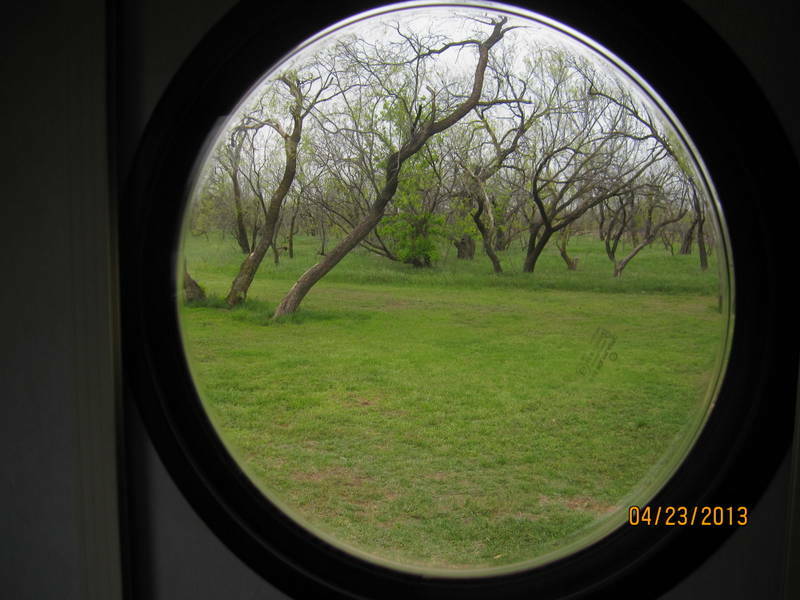 This entry was posted in cycling, great outdoors, simple camping, T@DA, weather and tagged camping, cycling, RV life, simple camping, T@DA, Texas, the great outdoors by Judy Crankshaw. Bookmark the permalink. Judy, is somebody checking your house? Lots of wet basements in the area including mine. That would not be fun to come home to find. Have a good time for the rest of your trip in spite of breakdowns. It’s all part of the adventure. Our neighbors checked this am. Whew…ok so far. Thanks for the thought. I hadn’t guven it any until hearing that the Chapmans were flooded.